Live dealer games have become increasingly popular over the last five years, and many casinos now offer live dealer games in one form or another. Thanks to advances in technology, live dealer games are now more widespread than ever before, and in this post, we’re going to take a look at what live casino games are, why they’re so popular, and some of the different types of games. We’ll also study some of the differences between online live casino games, and land-based casino games – so, let’s get started by taking a look at what live dealer games are. In a live casino game, a human dealer runs the actual game, from something which is known as a casino gaming table. 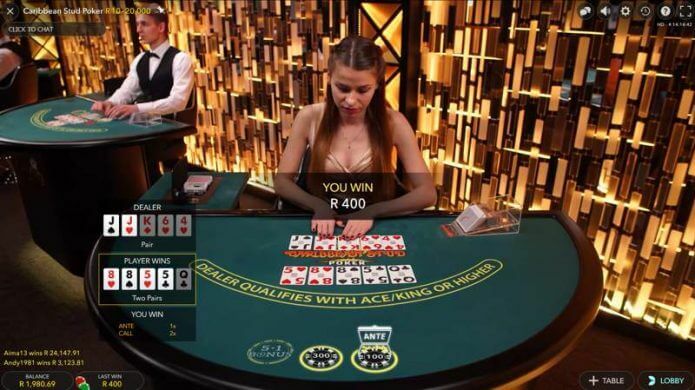 The dealer and the game are transmitted to the player’s device through a live streaming video link, and players can play from the comfort of their home, or wherever else they are in the world. 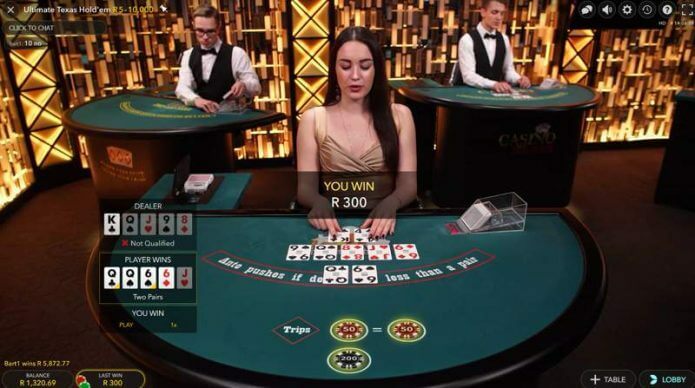 Depending on the type of game, players can make betting decisions from their device, and most live dealer games also allow communication between players and dealers, either through text chat, voice chat, or both. Once a player places their bets, the game begins, and the outcome of the game (i.e. what number the Roulette wheel lands on) is translated into data that can then be read by a complex piece of software. The ability to translate is called OCR (optical character recognition), and this means the result of the game is automatically displayed on the player’s screen. Live dealer games, for the most part, run in the same way that virtual casino games do. The main difference is that players can see with their own eyes the game playing out, and this helps to add to the gambling experience, while also allowing the player to know that it’s operating fairly. Live Casino vs Online Casino: What’s The Difference? We’ve already touched briefly on what the difference is between live casinos and online casinos, but there are a few more intricate details, which we’ll cover below. First and foremost, is the lack of an RNG (random number generator) when playing in a live casino. 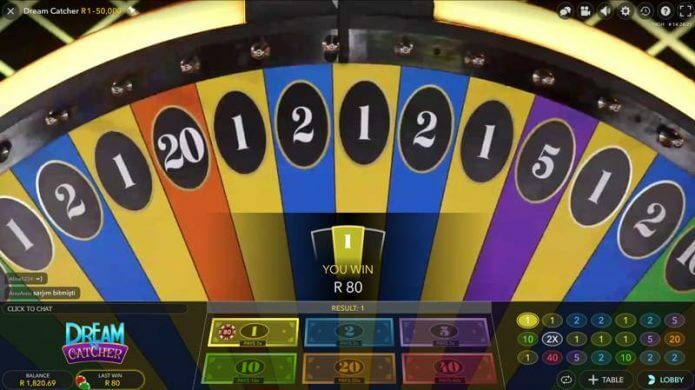 RNG’s are the driving force behind all virtual casino games, and every time a player places their bet and clicks the ‘Spin’ or ‘Deal’ button, a random number is pulled from the RNG, which is then displayed as a win or loss result. Live dealer games have the authentic feeling of seeing the action play out in front of your own eyes, and live casino players also have the chance to look at the cards being shuffled, see the Roulette wheel spun, and see the dealers dealing cards, and so on. Live casino games are popular for some reasons. We look at a few of these below. One of the big issues the online gambling industry faced until live dealer games became popular, was that many players felt as though gambling online didn’t ‘feel’ like gambling in a land-based casino. 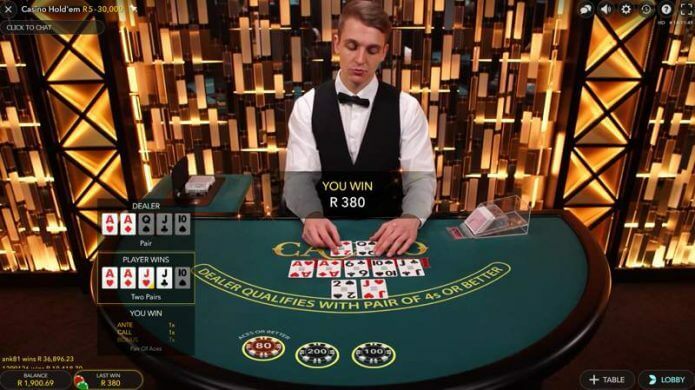 With live dealer games, a player can gamble from their home, or mobile device – but still get a ‘taste’ of the action. Another big issue with virtual online casino games is that the players have to take the software’s word that their games are fair. Now, while a third-party testing house has independently audited almost all games, players are still sometimes apprehensive about playing virtual machines – and this is something live dealer games have helped rectify. Another reason some players dislike virtual casino games, is because they feel as though there isn’t much of an interactive element. With live dealer games, you can chat to the dealer, and on busy tables, it’s often a happy and joyous environment, not too dissimilar to any of the tables you’d find in an actual casino on a busy weekend night. 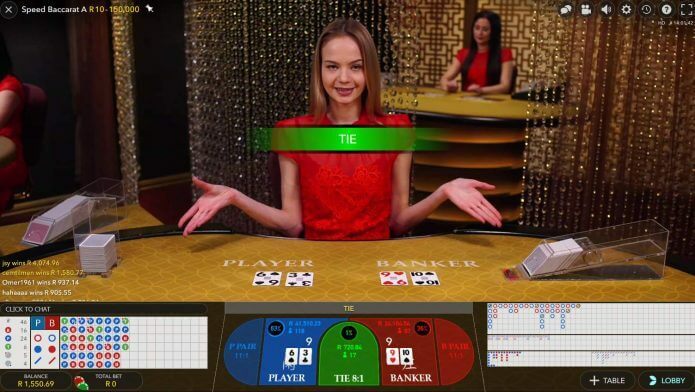 There exist a number of different live dealer games, and you’ll find everything from classic card games, to Roulette, and – more recently – some unique, brand-new game concepts. Below, we’ll look at some of the most popular live dealer games you’ll find online today. Blackjack is one of the two most popular live dealer games, and you’ll find this classic card game available at almost every online casino that offers live dealer games. Thanks to its popularity, Blackjack is now available in many different variations, and some of the most popular include Blackjack VIP, Single Deck Blackjack, Party Blackjack, and Pontoon. One thing that should be pointed out is that – for the most-part – online Blackjack tables do NOT allow you to re-split aces. It’s always worth reading up on the table rules of the table you’re playing so you’re familiar with how you’ll be able to play, as you could get caught out otherwise. Like Blackjack, Roulette is another top-rated live casino game, and, once again, you’ll be hard-pushed to find an online casino that doesn’t offer it in some form or another. There exist a ton of different live Roulette games, some of the most popular of which include Lightning Roulette, Roulette Party, VIP Roulette, Immersive Roulette, and Auto Roulette. It’s worth taking a moment to mention Lightning Roulette, as it’s become incredibly popular. It’s made by Evolution Gaming, and before the wheel spins, between two and five numbers are chosen at random. These numbers then have their payouts boosted to as much as 500X – and it’s possible to win some enormous amounts of money if you bet on one of the lucky numbers. Something else to look out for when playing Roulette online: it’s always best to try and play a European Roulette table, where possible. European Roulette tables have slightly better odds when compared against American Roulette. European Roulette only has one zero on the table, while American Roulette has two. Baccarat is another hugely-popular card game that you can find in land-based casinos all over the world, and as you’d imagine, it’s also found its way online. 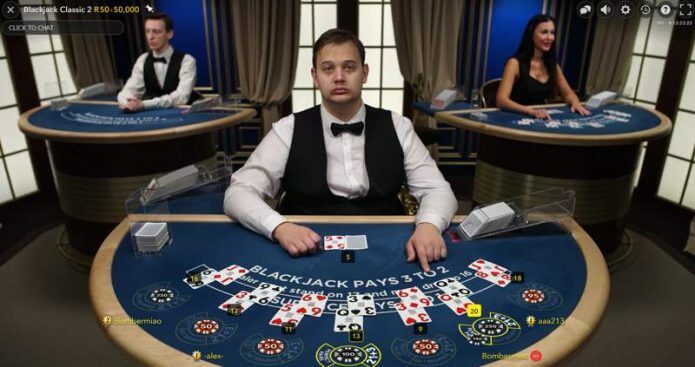 Almost every online casino that offers live dealer games will offer Baccarat in one way or another, and it’s a player-favourite, thanks to the ease at which it can be played, and the low house edge that accompanies the game. In Baccarat, you have three main betting options; first, you can choose to bet on the ‘player’ hand. Next, you’ve got the ‘bankers’ hand, and lastly, you can bet on that the game is a tie. It’s fairly self-explanatory, and if you’re looking for a fairly chilled out and laid-back game to play, live dealer Baccarat is a great choice. Ultimate Texas Hold’em is one of the newer games you’ll find in a live dealer casino, and while it’s similar to other poker-based games like Three Card, and Caribbean Stud, it is notably different. The main difference is due to the duration it takes to play the game. Hands take quite a bit longer than some other live dealer games – like Baccarat for example – and this makes it an excellent choice for those wanting to play something a little slower-paced. Ultimate Texas Hold’em isn’t quite as widely available as games like Blackjack or Roulette, but it can be found at a decent number of online casinos today, and if you’ve not given it a go yet, you will do well to check it out. Casino Hold’em – like Ultimate Texas Hold’em – is a relatively new game, especially when compared against the likes of Roulette and Blackjack. Still, it’s a game that you’ll want to check out thanks to its decent win-potential, and it’s exciting style – and many of the world’s biggest live dealer games providers offer Casino Hold’em, including Evolution Gaming, and Extreme Live Gaming. Caribbean Stud Poker was created back in 1982 by a professional poker player named David Sklansky. The game became an instant hit, and when the popularity of live dealer games started to increase, it wasn’t long before Caribbean Stud Poker was made available to play online. Caribbean Stud Poker is one of the most popular live dealer games around today, and you’ll find it at almost all casinos that offer live dealer games. It’s produced by a number of different game developers, and Evolution Gaming and Extreme Live Gaming both offer a variation of the game. It’s also worth noting that some variations of Caribbean Stud Poker feature a progressive jackpot attached, and this is an optional side bet which can be played (usually) for as little as $1. If you’re lucky enough to be dealt a Royal Flush, you’ll scoop a portion of the jackpot – and this is usually around 80%. It’s not uncommon for Caribbean Stud Poker jackpots to reach into the hundreds of thousands of dollars, so it’s a side bet worth playing if your budget allows for it! Three Card Poker is another poker-themed game that’s been made into a live casino game, and it was first created in 1994 by Derek Webb, designed for casino’s based in Las Vegas. Once the game began catching on, it was soon patented and offered in casinos throughout the world, and today, you’ll find it available at most casino floors you visit. Players favour Three Card Poker due to its low house edge, and the optional side bets which are available. The exact side bets offered vary depending on the provider of the game, but the two most common are the ‘Prime’ bet and the ‘21+3’ bet. Most online casinos offering live dealer games will offer Three Card Poker, and it’s not hard to find! Dream Catcher is a live casino game from Evolution Gaming, and it was the first title in the ‘Money Wheel’ selection of games that the company has been pushing over the last couple of years. Now, money wheels are nothing new; we’ve seen them used in casinos around the world (land-based venues), and they’re primarily seen as a bit of fun. Friday and Saturday night crowds love to have a punt on the wheels. But Dream Catcher takes things to a new level, and this is thanks to the carrying-over multiplier. On the wheel, there’s a 2X and 7X multiplier notch. If this notch lands, a re-spin is awarded, and all bets remain. The winnings are then multiplied by whichever multiplier the wheel fell on. However, if another 2X or 7X multiplier lands, they multiply against one another – and this continues for as long as they land. So far, the game has produced a 7X 7X 7X multiplier, which allowed some players to win tens of thousands of dollars from a relatively small stake. Dream Catcher is available at all online casinos that feature Evolution Gaming’s live dealer games, and it’s quickly become one of the developer’s most popular releases to date! Sic Bo is a popular Asian-based dice game, and while it’s not the most popular live casino game in existence, it’s one that gets a mention, as it is beginning to become more popular with players. Not all game developers offer Sic Bo – but you’ll find variations from HoGaming, Opus Gaming, Bodog88, and Playtech’s Asian Studio – although it appears as though not all casinos offer it. The scarcity of this game in a live dealer variant may change in the future, as it continues its growth in popularity, but for now, you may have to ‘hunt’ around to find it! Dragon Tiger is another exclusive from Evolution Gaming, and this Asian-inspired slot is one of the more fast-paced live dealer games, with a full game taking just 25 seconds to complete. One of the reasons players feel captivated by Dragon Tiger is the fact that it’s set in an impressive-looking studio. The game itself is based loosely around Baccarat, and you’re simply betting on whether the player or the dealer will be dealt the highest value card. Like Baccarat, the game also has a ‘Tie bet’ option, which pays out when both cards dealt are of the same value. It’s incredibly simple to start playing live dealer games, and the first thing you need to do is make sure your casino account has enough funds. Once you’ve made a deposit, it’s merely a case of finding the right live casino game for you. Most online casinos now have a dedicated ‘Live Casino’ tab, so you don’t have to search manually through all of the games. You’ll be able to see all of the tables currently running (and even the closed tables will usually show the time at which they next open), and from there merely open up the game, select your chip value, and place your bets. 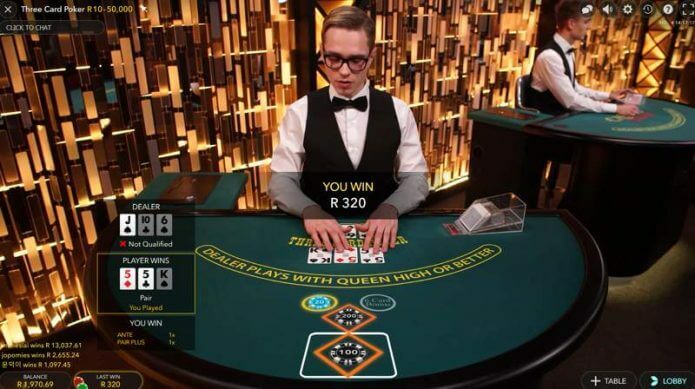 Once your bet has been accepted, you will see the game action play out right in front of you, and if the game you’re playing requires player-input (like Blackjack for example), you will see buttons appear on your screen, that you can click to dictate your desired move. Once the game is over, winnings will automatically be credited to your account, and the next game round will then begin. Most games offer a ‘re-bet’ option which allows you to repeat your last bet. Some tables also offer a ‘repeat and double’ option, which repeats your last bet while also doubling the value of all the chips. There are, now, quite a few providers of live dealer games, and in this section, we’re going to take a look at some of the most well-known and popular. Evolution Gaming is known as the market leader in the live casino games area, and their deep licensee base means they can be found offering games to players all over the world. Their live dealer games studio has over 100 gaming tables, which means they offer some of the best variety around, and their browser-based games run on state-of-the-art technology, which very rarely lags or freezes. Another huge name in the live dealer games field, Playtech has established more than one live dealer casino, with their ‘Asian Live Casino’ being a popular offshoot of their main live casino games studio. They offer a tremendous range of games, and again, use state-of-the-art technology to ensure excellent video clarity. Microgaming was one of the last game developers to enter the live casino games market, but they’ve done well so far, and their game range – while not as large as some of the other providers – includes all of the stapes (Roulette, Blackjack, Baccarat), as well as some poker-based games. The Novomatic group operates Extreme Live Gaming and is a highly trusted name in the online gambling world. Extreme Live Gaming offers a massive number of games and pride themselves of ease-of-use and accessibility. 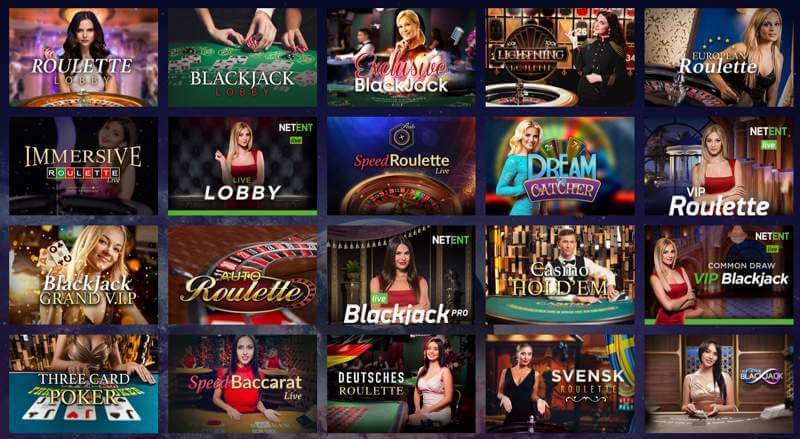 One of the biggest players in the entire online gambling space, NetEnt have expanded their reach by offering one of the top live casino games studios in the world, and their simple, easy-to-use interface has become a hit with players. They also provide a wide variety of games, which have some of the highest betting limits, making them well-suited to high-rollers. Probably the biggest thing to remember – and the most important, especially if you’re used to playing virtual casino games – is that live dealer games play regardless of whether you’re ‘ready’ or not. For example, in Live Roulette, you will see a timer counting down. The period is usually 30 seconds, but it can also be shorter, and once this timer reaches zero, no more bets will be accepted, and the game will begin. It’s incredibly important to make sure you’ve placed your chips on the table in time, as, if you don’t, you could find yourself faced with a situation where you’ve only managed to get half the amount of chips you wanted to place. Another thing to remember is that on table games, like Blackjack, there will likely be other players at the table. In the case of Blackjack, and Baccarat, more than one player can share the same hand, so don’t be confused if you choose to ‘stand’, for example, but the dealer deals a card anyway. It just means another player has chosen to hit (take a card), and your hand will remain active, regardless of their decision. Something else to remember is that the dealers rely heavily on tips. They are paid a basic wage – but it’s usually relatively low, and when you tip dealers online, it will be shared equally among the dealers, so don’t think that just because you’re playing online, you can’t tip. One final thing to point out is that many of the live dealer games have multiple tables. These may all look the same, but something that does tend to change is the betting limits. For example, you may see two identical-looking Blackjack games, and find yourself wondering what the difference is. One of the tables may offer betting limits between R10-R1000, while another may provide betting limits between R25-R10,000. It’s always worth making sure you play your preferred game at a table you’re comfortable with, as there’s nothing worse than feeling out of your comfort zone by staking higher sums than you intended. Live casino games have become incredibly popular. They’re everywhere – almost all online casinos offer them. And it’s clear that their popularity is only continuing to grow. The fact that you can now play casino games from the comfort of your home (and see the game playing out in front of you) is game-changing, and with top developers like Evolution Gaming continuing to push the boundaries, there’s no telling what we’ll see next!